Maradhi Manni: An Unsung Heroine - Chitra (Jagjit) Singh! An Unsung Heroine - Chitra (Jagjit) Singh! 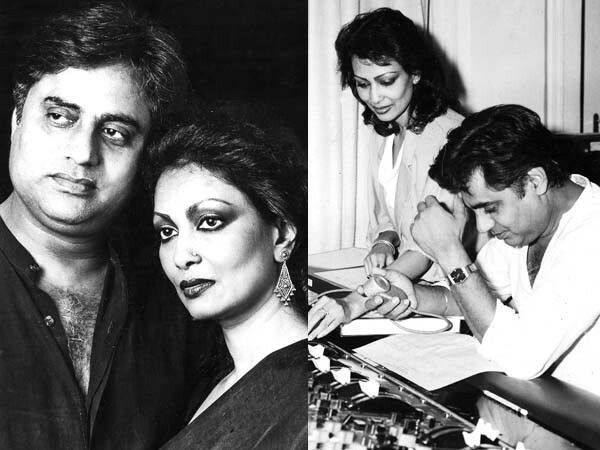 Jagjit Singh and Chitra Singh, the famous ghazal singers! I did a post on Jagjit Singh's ghazals long back. Our whole family is a great fan of Jagjit and Chitra Singh. The post is here. His wife Chitra Singh also is a great ghazal singer. We have heard her solo songs and songs she sang with her husband too. But mostly people talk about Jagjit Singh and I haven't heard anyone mentioning Chitra Singh's name! I and my son love her voice. She is born a Bengali and married Jagjit Singh and both of them started giving concerts. Normally, ghazal singing was conducted in elite homes in those days (Mehfil). Slowly some singers like Mehdi Hassan and Ghulam Ali started giving concerts in public places. And Jagjit modernised the ghazal singing by using unique instruments like guitar, santoor etc. So, he and his wife, became very popular. Their songs were easy to follow and we could sing along too! He was particular about the lyrics being clear and simple, but with sincere emotions. He was interacting with the audience who were thrilled to get involved in the concerts. Now, let me come back to Chitra Singh. She is not a trained singer. She developed singing just by hearing good music. She met Jagjit and married him in 1969. I am not going to write about her personal life. I am an admirer of her and her husband's singing. We will stick to it. In the beginning, they were singing in jingles. Later on, both of them started singing ghazals and their audio CD's became a hit. They reached the homes of ordinary people who were used to hearing just film songs. Our family includes in that category. I have told you in Jagjit Singh's post itself how we started listening to ghazals. His simple ghazals hooked us to hearing mostly his CD's plus some more, like Hariharan's. We were fans of Latha and Asha and other singers' voices until then. After we got used to hearing Chitra's voice, we started liking her's too. My son used to say that we have to keep on hearing and 'develop' liking to good music! Their ghazal concerts became famous gradually. I have never heard of them performing here, in Chennai. Jagjit gave concerts alone later in his life but his voice was a bit shaky by then and my son wanted to keep his good voice in memory always. So, we didn't attend his concert here. It would have been nice if we had the opportunity to hear them live. But we developed the liking for ghazals very late! She has got some good film songs to her credit and many ghazals which are memorable. Let me give them here. Her voice is unique. 3. Har soo dikhai dete...just admire her voice! 4. Aisa lagta hai...zindagi tum ho....lovely song! 6. Ishq mein...Chitra is singing...Jagjit Singh starts the concert with some humour. This nature of his, has made the pair very famous. They interact with the audience and so the concert is always lively! I have got this CD at home! This is one of my favourites! 7. A Punjabi song...typical concert atmosphere. Jagjit is a Punjabi and Chitra is a Bengali, but she sings this Punjabi song, beautifully! This song is in the CD I have with me. If you had asked me to hear a Punjabi song, just like that, I wouldn't have listened to it. But when I am made to hear with other ghazals, I just let it play and slowly I started liking it! I have noticed in music reality shows also, when we hear Punjabi songs, we notice that have a kind of 'josh' in them which makes people dance! This is one of that type of song. I sing along this also without knowing the meaning and mostly the words might be wrongly pronounced too, I know! But this is good! When other people sing Ghulaam Ali's or Hariharan's ghazals, we immediately recognise and say that this is Ghulam Ali's ghazal or Hariharan's ghazal. The aalaap or sargam varies from each other's singing. Same thing happens with AR Rahmaan's songs or RD Burman's songs or SD Burman's song. We recognise them with some musical notes or instruments or something. Like that way, we recognise Jagjit Singh, Chitra Singh's songs also. In some way, they sound similar to their previous songs...some thread is there in every song! Maybe, this is called 'Gharana'! Whenever I played Jagjit and Chitra's CD, I used to think that Chitra is not recognised properly. I like many of her songs. I have compiled the songs I got in 'You tube'. Some of my favourites were not available. Now, watch the concert! Both of them look very young here and their voice at their best. I am not very familiar with this song, though! Should keep on hearing it and then we will like it...like it happens with AR Rahmaan's song! I love Chitra Singh's 'Safar mein dhoop toh hogi' a lot. You can hear that in my earlier post on Jagjit Singh here. Which song do you like of Chitra Singh? USHA PISHARODY: She never tried to come to the limlight. She was always behind Jagjit. Too many tragedies in her life. The last time I saw her was in a musical reality show, saregamapa, I think. I have listened to some recent songs of Jagjit Singh but I have never listened to Chitra's songs! I see a number of Youtube links on this page and I will come back to listen to at least a couple of them (My Internet has become very slow in the last couple of days). you post is bang on ! I guess we all have liked Chitra Singh's voice and have sung her songs... strangely she has been really low key and as you just said it an unsung heroine... ! DESTINATION INFINITY: Yes, the Sarfarosh song is very good. The movie also was very good. One of Aamir's best movies! Sonali was not used in that movie! She is a good actress if given an opportunity! Listen to 'Safar mein dhoop toh hogi' first! I am singing that for the past 3 days now, since I started preaparing the draft! If you like her voice, you can hear more in the 'you tube'! Many more are there of Jagjit's! My favourites of his songs will go to 2-3 posts! Simple lyrics, not much Urdu words too! Tune also is very easy to follow! Listen to some songs from my post about him! You will enjoy! HITCHWRITER: Yes, she is not a much 'talked about' singer like her husband. But we like her voice. i didn't knew she is a bengali considering the fact that she speaks punjabi so fluently...! I have been a staunch follower of both Chitra and Jagjit Singh. I was lucky to have met them personally at a wedding. RAHUL AGGARWAL: I have heard their Punjabi songs which come alongwith their ghazal CD's songs. Looked for Punjabi Thappe songs in 'you tube' and heard it now! It is interesting! I have posted it now! Thank you! They seem to enjoy singing this song! BK CHOWLA: Hmmm...you are lucky to have met them! Ghazal singing became famous because of them, I heard! Unlike Mehdi Hassan's and Ghulam Ali's, which are very good too, but with lot of classical touch, Jagjit's ghazals are a bit light and easy to follow. That must be the reason for them to become famous with ordinary people too! Chennai concerts were overflowing with people, I heard, even though the tickets were very expensive! Chitra's voice is a revelation for me. I listened to all the songs that you've put up and she sounds like a seasoned musician despite lack of formal training! However, I find many of them similar and this is where I think your ARR analogy will work! Listen to it many times and you will start appreciating it :)Thanks for enlightening me with this wonderful post! Btw, I am totally hooked to Hariharan's Ghazals. MALINI: I am very happy to read your comment here! My neighbour was introduced to Jagjit Singh's ghazals via 'meghame meghame' tune! He used to hear only Tamil songs until then. Later on he was asking me to play Jagjit's ghazals! And he was a senior citizen! Vani Jayaram has sung that song very well. Yes, their songs have some 'gharana' I think. They sound similar. I too love Hariharan's ghazals but I am more famiar with Jagjit's! My son's influence, maybe. He is crazy about him. Did you hear 'safar mein dhoop toh hogi'? I am sure you will love it! Nice to know that both you and your son are great fans of Jagjit and chitra singh.The post brings out your fascination for ghazala and good voice. Genearlly when couples sing the ladies recede to background and have low profile.I witness it even in Carnatic music world. K PARTHASARATHY: Yes, it is there everywhere, Partha Sir! Many women stop their singing in most cases. SHAIL: Their songs are easy to follow. Normally ghazals are full of 'harkathein'...gamakas! Even 'koi paas aaya, savere savere' is easy to sing (along) by people like us who haven't learnt music! That is my most favourite song of Jagjit which is in the earlier post on him! RADHA: Even I thought her voice to be too shrilly(! ), in the beginning but after hearing again and again, I started liking her voice too! Son used to play his CD all the time! Even now he plays them while driving, mostly! I listened to 4,5. She has a good voice and is singing from the heart. The songs seem almost flawless! But, Jagjit Singh's voice has more depth. But for listening to songs, I prefer raaga.com or music.raag.fm than Youtube. DESTINATION INFINITY: You said it...she is not a trained singer. She sings from the heart. Well...she cannot be compared to Latha, Asha or Shreya. They are godsend singers! Chithra Singh's voice is unique. Yes, his voice is divine. Some of his songs are in my previous post about him. I haven't tried raaga.com. Will try now, thank you! Usually, never listen to North Indian music. Thanks for creating an interest for me. Great singers both, Jagjit and Chitra Singh! She has a really lovely voice. I used to listen to Gazals during my college days, after that period I have not been actively listening to Gazals as such. However, it was a pleasure to listen to a few posted by you. same here.. just like DI said, I have listened to few Jagjit Singh's songs, never got a chance to listen to Chitra's. Will check the links you have given. SG: If you like melodious music, you will like this also, SG! R.RAMESH: Yes, his Krishna bhajans are famous and I like them too! AVADA KEDAVARA: Many people know about Jagjit Singh, maybe through the movie songs. Chitra has sung in a TV Serial, Mirza Ghalib. Yes, she is not very famous. I think you will like them! Thanks for sharing these songs- a treasure indeed! DAMAYANTI: Welcome to my space, Damayanti! Yes, the songs of both of them are treasures! Thank you! They were my dad's favorite Ghazal singers.